In order to understand the Arab-Israeli conflict, as it unfolds today, it is necessary to have an accurate picture of the historic circumstances that led to the establishment of the Jewish state and the Arab world's rejection of it, as well as the developments that have since then shaped the conflict. This historic presentation covers the most important events in the history of Israel, from the Jewish kingdoms of David and Solomon to the collapse of the Oslo peace process in the fall of 2000. The remaining period from the turn of the millennium until today will be added as soon as possible. It is not the intention to dig into and analyse every detail and contentious issue, but rather to provide the reader with a basic historic knowledge and understanding of the conflict's causes and effects. The material can be read chronologically from beginning to end, or may be used as a work of reference, allowing the reader to select any specific period of interest. If, for instance, you want to focus on the establishment of the modern state of Israel, you may want to skip the first chapter, "Early Times", and move directly to Chapter Two. Let's start by placing Israel on the map. 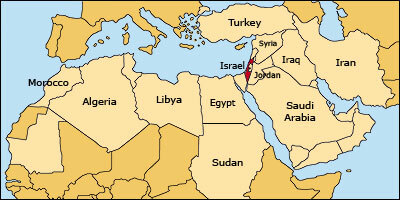 Israel is located at the eastern end of the Mediterranean Sea, where Europe, Africa and Asia meet. The country borders on Lebanon and Syria in the north, Jordan to the east and Egypt to the south. The conflict between Israel and its Arab neighbors seems to claim a lot of attention in the world media, but the area that includes both Israel, Gaza and the West Bank actually only comprises about 28.000 square kilometers - or approximately the size of Belgium or Hawaii. On the map you can see Israel (in red) compared to the surrounding Arab or Muslim countries that make up the rest of the Middle East and North Africa. Follow the chronological presentation by clicking the link below, or go directly to a certain period by using the menu on the left.